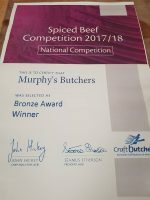 The Murphy family of Midleton have been providing quality meat products and great service to their discerning customers, in their traditional butcher shop for three generations. Their meat is sourced from local farmers, who, in turn, have produced the highest quality lamb, beef and pork on the rich farmland of East Cork. The meat is processed in Murphy’s organically certified abbatoir and delivered to the shop for the delectation of customers who take the term ‘Farm to Fork’ seriously. The qualified Craft Butchers in the shop are at hand to provide advice and friendly service to everybody from the experienced cook to the culinary beginner. A superior quality family butcher on Main Street, Midleton.